Karditsa-net. - Nevropolis of Agrafa. Unrivalled natural beauty. The borders of the municipality of Nevropolis start at the junction of Mouzaki - Kerasia. The municipality was created from the union of seven communities: Belokomitis, Karvasaras, Karitsa, Krioneri, Neohori, Pezoula, Filakti. The population of the municipality, according to the 2001 census, comes up to 3.601 people. 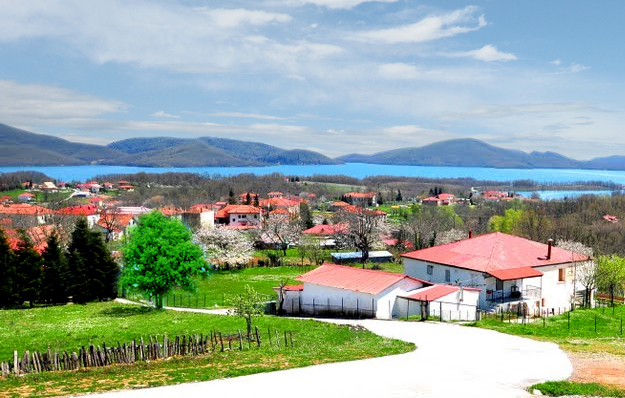 It covers geographically the west side of Plastiras Lake and includes almost all its modern tourist facilities, which are constantly being developed. This fact makes the municipality of Nevropolis of Agrafa stand out from all the other municipalities of theprefecture of karditsa as regards tourist infrastructure and development. 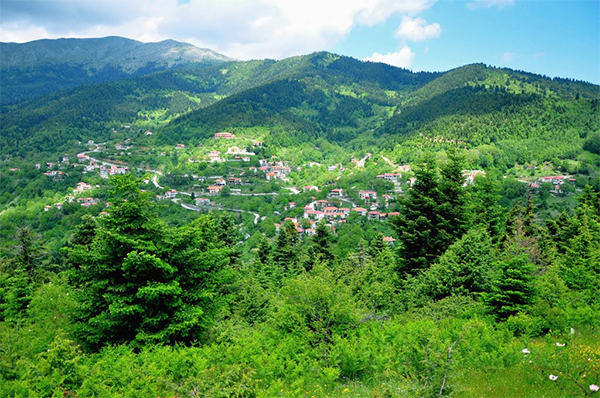 The seat of the municipality, Pezoula, is 34 km to the west of Karditsa at an altitude of 900m. 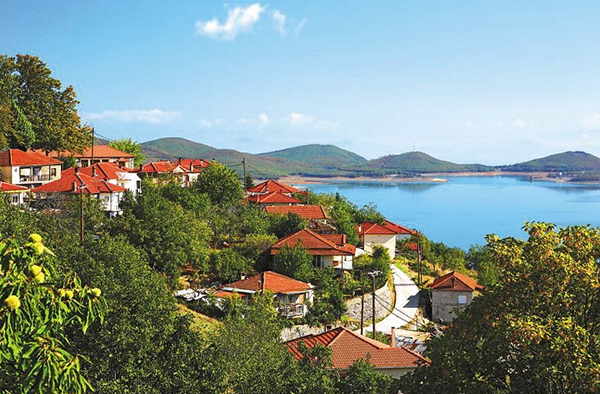 The first village we come upon in the municipality of Nevropolis is Krioneri, a village with abundance of water, fertile land and industrious people who supply the Plastiras Lake region and the prefecture of Karditsa in general with tasty garden produce. Along the route from Krioneri to Kalivia of pezoula, there are (mainly during the summer months) makeshift benches belonging to the region's producers selling fresh garden produce, sweet preserves and honey. Quite close to Krioneri, at Koutsodimos lcation, a modern housing settlement with newly built rooms to let and suits can be found. The houses of the mountain slopes to our right belong to Kalivia of Filakti. the village is located in a prominent position, among the trees, with a panoramic, completely unhindered, view over the lake. The snow-white landscape in winter, with the big blue "spot" of the lake in the horizon, the freshness of the vegetation in spring, the cool breeze caressing us in summer and the enchanting feast of colours in autumn, all create a unique landscape offering moments full of pleasure to visitors. Following the central road axis, we come upon Kalivia of Pezoula. The shabby huts of the farmers and cattle raisers of Pezoula prior to the creation of the lake have been transformed today into beautiful, luxurious summer houses, hotels, guest houses, rooms to let that can be afforded by people of all walks of life. There are also different kinds of enterprises offering their services to thousands of visitors. Kalivia of Pezoula constitute the most important tourist junction of the whole region and a cosmopolitan tourist center offering all comforts, services and provisions that visitors request. One can find in the village, a pharmacy, ATMs, a kiosk selling newspapers as well as information material about the area, hotels, taerns, cafes, conference halls, gift shops etc. The Town Hall and the Citizens Service Center can be found in the renovated school, in the upper part of the village. At a distance less than 2 km from the central road, in the beautiful shore of the lake, there is the magnificent Pezoula Beach, a beautiful area next to the lake suitable for a stroll, recreation and food. There is also an open air theater where important performances are staged and quality events held every summer by the municipality of Nevropolis. Near the beach, there are organized recreation areas, archery areas, etc, as well as alternative tourist enterprises offering a variety of equipment for sports in the lake, cycling along the paths or the nearby cycle roads. Going right on the crossroad at the center of the village, the fastidious visitor has the opportunity to get acquainted with "their metropolis", the beautiful Pezoula. To visit Filakti village, the Historical Neraida, the Agrafa shelter, the small ski slope at "Karamanoli" position, the towering mountain tops with their vast view and the green slopes surrounding the plateau. After about 3 km, going through a beautiful chestnut forest, we come upon Pezoula, the birth place of Saint Seraphim, which was built approximately 500 years ago. The village is indeed a shelter for the visitors who wish to enjoy nature and the tranquil mountainous environment. At the village center, with the narrow streets and the rich vegetatation, near the big church, there are traditional cafes and taverns offering exemplary service and friendly and cheery authentic Agrafiote reception. Of great interests is also the triconch arch-covered church of Saint Panteleimon on the east side, a little outside the village within a thick forest opening, with a view over the lake. Near the Mega River banks, full of planes, on the way to the village of Filakti, there is still today the picturesque watermill of Koutras. Next to the watermill, the "nerotrivi" (the facility to wash clothes) biologically washes and cleans the "flokates" of the people of the region. Filakti is located on the steep slopes of mountain Voutsikaki, at an altitude of 1.000m and 2 km from Pezoula, surrounded by the Petralona (1.300 m) Tsoukarela (1.600 m)vand Kafky (1.800 m) mountain tops. The village has many stone-built fountains and offers rich and hospitable tourist infrastructure (guest houses, cafes, taverns) and a folklore museum in the renovated old school. The folklore tradition hall of the museum exhibits objects related to the occupations of the people of the Agrafa region. The other hall of the museum represents a traditional school class of the 60's with all the objects and the features of the elementary schools of that age, bringing many memories to the minds of the visitors... At the top of the village, there is the Holy Monastery of the Holy Trinity (17th century) with a carved wood altar screen of 1852 and frescoes of the 17th century, a gem and jewel for Filakti. Hares, deer, partridges etc live in the extended forest areas of the village which include firs, oaks and cedars. 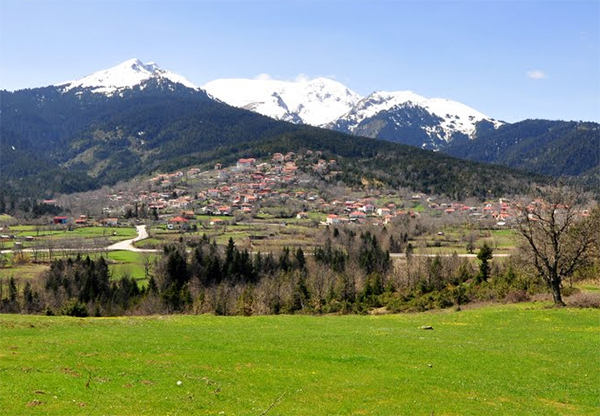 Opposite Filakti and higher than Pezoula, there is the historical settlement of Neraida, at an altitude of 1.120 m, where one can go either following the asphalted road starting a little before Pezoula or from paths that have very good signs. Before the war and a little afterwards, Neraida was one of the most important resorts of the people of Karditsa. It was also the favorite holiday place of Nikolaos Plastiras. Today, the settlement has a tourist infrastructure and hosts many visitors thoughout the year. The landscape is unique in beauty as well as in climate conditions. The beautiful houses are built among the firs having an unhindered view over the lake. The area is suitable for strolls and tours using a mountain bike on its forest roads and well-kept paths. After 7 km of beautiful uphill route from Neraida (the road is being asphalted), we come upon the Agrafa resort at "karamanoli" location (1.535 m) with a unique view. The shelter is made of stones, equipped with modern facilities and is the starting point for hiking and climbing in the nearby mountain tops. It has 24 beds, central heating, a big hall with fireplace for the climbers to share their stories and adventures, a kitchen with facilities for food preparation, food for anyone interested. Mr. Vassilis Tasiopoulos, the experienced guide, can take you on a detailed tour. It is open for all nature lovers throughout the year. Some hundreds of meters before the Agrafa resort, there is a small ski slope and the resort of the Karditsa Ski and Alpine Club. It has restricted comforts but with the capacity to accommodate 17 people. With Kalivia of Pezoula as a starting point, on the way to Neohori, we can visit the Botanical Garden, 5 km from Kalivia of Pezoula, some hundreds of meters from the central road and next to the lake's waters. The Botanical Garden are open all year round (Mr. Papantonis, tel: 6973999013). The visitors can see first hand a big variety of rare plants of the region and plants under threat of extiction. They can go around the Garden and be informed by the competent person, buy aromatic plants, herbs, drink coffee and refreshments and be informed for issues of environmental interests of the area. The flora "kingdom" of the Garden includes approximately 350 species of plants and is divided into sections: areas with mainly wild bushes, eco-systems of the region, nursery gardens, with bass wood and firs, wetlands, aromatic and ornamental plants, plants of the region theatened with extinction etc. Important restoration works were recently carried out with the initiative of the municipality of Nevropolis and the finance of the initiative leader +. Cobbled pavements were constructed, beautiful flower beds were created, fences were made of stones and wood, signs were put up giving information about the plants and other interventions were carried out. These works upgraded the Gardens' aesthetics and made the tour more pleasant and informative. The International Day for the Environment, on the 5th of June, is a special day for the Botanical Gardens and the municipality of Nevropolis as it is celebrated with the participation of hundreds of people from the region's villages in the various organised events. The visitors of the Botanical Garden can cycle on the cycle road that goes up to Kalivia of Pezoula, go for a walk to the lake which spreads 50 m below of go fishing. They can also rent the necessary equipment (hydro-bikes, recreation boats, boats, windsurfers etc) for a group or individualtour in the lake, to try their hands at archery etc. Next to the garden, in an area granted by the municipality of Nevropolis, a modern sailing yacht center is being set up, which will meet the needs of the students ohe Trikala Faculty of Physical Education and Sport Science specialized in outdoor activities, as of the summer of 2008. Neohori spreads on a slope with a wonderful view at a distance of 1 km from the Botanical Garden and 38 km from Karditsa, at an altitude of approximately 1.000 m. It is the biggest village of the area with a long history and rich tradition, significant and modern tourist infrastructure and one of the most important tourist destinations in the area of the Plastiras Lake. It provides visitors with many guest houses and rooms to let, taverns, bars, shor with folk art objects, a kiosk selling newspapers, butchers' shops, a mini market, traditional cafes and last but not least, an unhindered and panoramic view over the lake. The recent restoration of the "Malokedros" area (near the church of Saint Nikolaos with frescoes dating back to the 16th and 17th centuries) and the creation of a recreation area give the possibility to visitors to walk around and enjoy the tranquility of the nature and Plastiras Lake from a privileged position with a panoramic view. The main festival of Neohori takes place on the 7th of January, while the society of the Friends for the Protection of the Environment holds the annual reunion of the people of Neohori on the 15th of August. 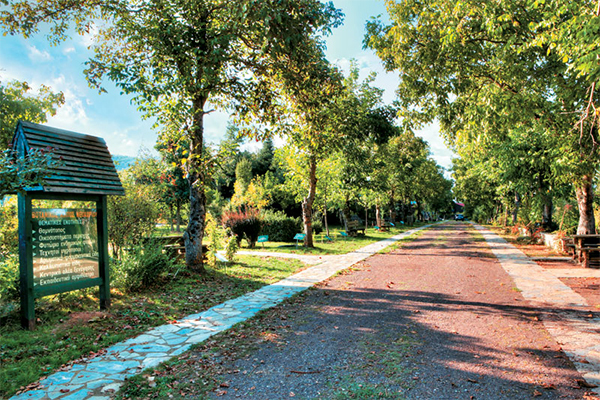 The Center for the Environmental Education, Research and Information has been housed in the old school of Neohori, near the central road, belonging to the competency of the Development Society of Karditsa, since 1996. It aims at providing environmental education, timely information, management of the natural sources of the region, the protection of ecosystems and the promotion of research for the natural environment of the region. It is visited by hundreds of visitors every year, mainly students from all over Greece (tel: 24410 42363). Its contribution to bringing awareness for issues as regards the protection of the environment and the region in general is of vital importance. Our route around the lake continues to the villages of Belokomitis, Karitsa, Karvasaras, the Tavropos Dam and the east side. Its beauty is difficult to described and impresses all year round. We go over the lake's fiords, next to towering firs and chestnut trees. We see Mountain Olympus, the whole east side of the plateau, Mouha, Belokomitis, vast forest with the high firs, the Alonaki Estate and the clear blue waters of the lake. Belokomitis is 4 km from Neohori and 42 km from Karditsa. The village is amphitheatrically built at an altitude of 950 m surrounded by an oak and fir forest with especially rich flora and fauna. Few people stay in the village during the winter, but their number considerably increases during the spring and summer months. Going past the village and the taverns on both sides of the narrow village road, we see the Keredan canyon with the Gakis cave and the mountaintops Borlero and Arapis. At a small distance from the last house of the village, the signs at the crossroads direct us to the Dam or Karitsa of the Dolopes. 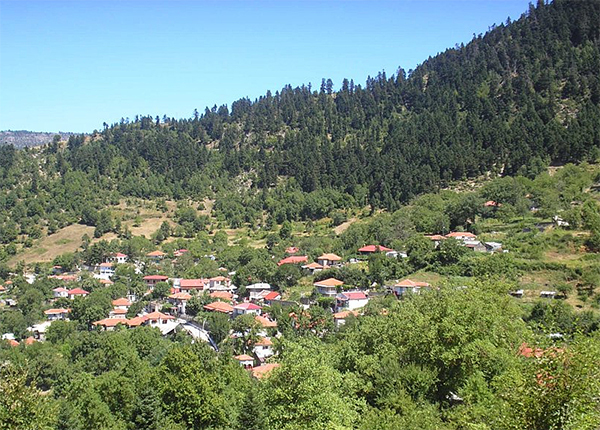 Karitsa, a historic village with few inhabitants in winter and two cafe-taverns open all year round, 48 km fom Karditsa. Karitsa is built on the North side of the gorge of the Karitsiotis River, whose clean waters end in Plastiras Lake, going under towering firs, broad-leaved planes and pliant willows. Thousands of visitors go to Karitsa having as their main destination the Holy Monastery of Pelekiti, approximately 3 km above the village, at an altitude of 1.400 m built on a steep rocky slope. The monastery was built during the 15th century and it was concluded in 1529 by Saint Damianos, the new martyr. Its name (pelekiti) comes from the fact that the monastery is hewn from the rock where it is located. It is dedicated to the Dormition of the Theotokos and celebrates on the 15th of August when many events are organised. Going throug the dome-shaped pronaos, we get inside the main church of the monastery complex, the church of the Transfiguration of the Savior, which is single-aisled with a narthex. According to the inscription, the hagiographies were made in 1654. The other church, the church of Panagia Faneromeni, is built in the Mountain Athos style. According to the inscription the Hagiographies were made in 1666. The monastery has been recently renovated, financed by the EU. It is open most of the days of the year. Leaving the monaster, after buying herbs, tea from the inaccessible mountaintops of the region, honey or baked chestnuts and other local products from Stella and Sotiris, we return to the central road axis in order to continue our route around the lake and enjoy the other beauties of the area. Reaching the Karitsiotis River, we can quench our thirst drinking water from the stone fountain, rest on the wooden benches under the shadow of the planes' leaves. We can let our minds wander sitting on the bank of the river with the cold waters in the summer and the heady flow in the winter and get informed about the surrounding area and the paths from the outdoor map. Very near, almost on the Karitsiotis River waters, there is the fish farm "Evritos" and its select fish tavern. The road on our left leads to the Dam and the east side of the lake. The road on the our right leads to the Keredan Gorge, the Gakis Cave, the settlements of Karitsa, Holiano and Mega Rema, to Karvasaras, the sources of the Karitsiotis River, the Kaimakia Cave Petrilo and East Argithea, Vraggiana of Evritania and other villages. The landscape of the region becomes wild but its exceptional rugged beauty is appreciated by the few daring visitors... Karvasaras is approximately 6 km from the central road axis of the lake, built at an altitude of 1.200 m. During the Turkish occupation it was a caravan stop, which gave its name to the village, for rest and replenishment. The village almost deserted in winter, is surrounded dy a fir dorest and higher there are big meadows that in summer are full with the sheep coming down from the pasturelands. The road to Karvasaras is asphalted (in its bigger part) and goes along the Karitsiotis River bank, through rich vegetation and "gentle" natural wilderness. The "Vaeni" location, 2 km before we come to Karvasaras, at the union of the Karisiotis and Karya Rivers, is suitable for recreation and rest. From "Vaeni" the road goes up along the right Karitsiotis River bank and reaches Mega Rema (a settlement of Karitsa in an area full of walnuts and rich vegetation) and East Argithea. A few kilometers higher than Mega Rema, we come upon Kaimakia cave, approximately 500 m from the road to Petrilo. Its abundance of water creates a small waterfall falling in the Karitsiotis River and the lake. On the way back from Karvasaras, a few meters before we reach the road axis that goes around Plastiras Lake, the road leads us to Keredan Gorge and the Gakis Cave. The cave, according to the speleologists that have explored it, is one of the most important ones of the Agrafa. Its entrance is indistinguishable even when we get very close. It is an important bat habitat and visitors must be accompanied by a speleologist. The way to Gakis Cave, 3.200 m long, follows the panoramic route of the ravine with the broad-leaf planes, the rich riparian vegetation, the high firs, beeches and oaks. An easy and pleasant route. 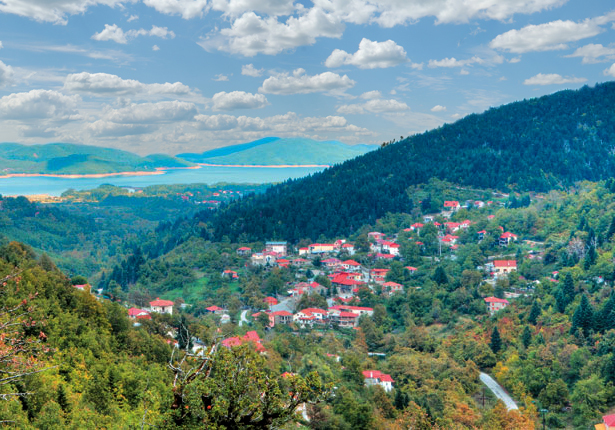 Going from the Karitsiotis River to the Dam, on the right, the Belokomitis forest extends covering an area of approximately 6.000 acres (stremata) with rich flora and fauna. It is easily accessible as it is crossed by a network of forest roads and paths that have information signs. The Observatory is in the forest and a small shelter a little higher up in the "Elatakos" location. Following the sign and the asphalted road for Kedros (Zygogianneika), a village we reach on the central road axis 3 km after Karitsiotis River, we come upon the Observatory.